Big Luxury, Intimate Setting Whether it is an intimate gathering or a large celebration, location is everything. Luxe City Center Hotel has everything you need from private rooms to chic ballrooms, we’re smack dab in the center of the hottest neighborhood in LA. Your guests will have the best of the best within reach, before, during, and after your event. Ideal for private VIP dinners, receptions, corporate meetings, brunch and birthday celebrations! 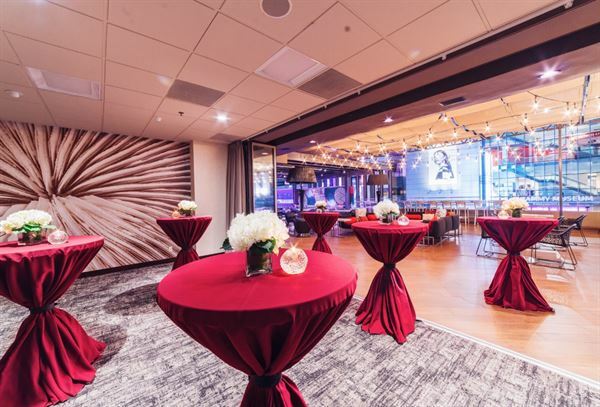 Ideal for meetings, seminars, and special occasions, the 3,000 square foot Ballroom has floor-to-ceiling glass doors, allowing natural sunlight in, and when opened, extends to the space onto an outdoor terrace of fire and water features and private cabanas. An optional soundproof wall divides the Ballroom into two event spaces: Figueroa Room 1,400 sq. ft. | Olympic Room 1,600 sq. ft. The stylish décor and functionality of our Boardroom are dedicated to the success of your important occasions. Accommodating up to 12 guests, this enticing space is perfect for small meetings or private dining. A 2,600 square foot patio with private cabanas, a cozy fire pit and sculptured water feature, overlooks the nightlife of L.A. LIVE.